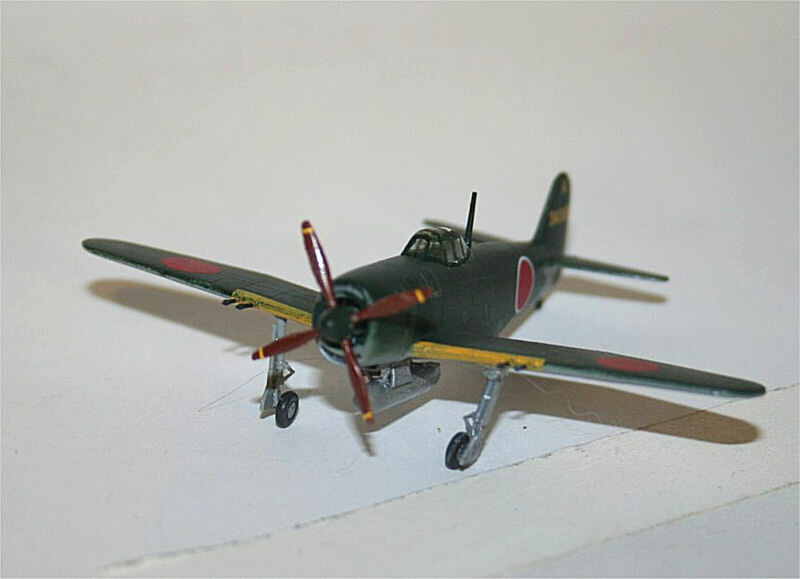 Kawanishi N1K2-J Shiden Kai "Later Version"
The Kawanishi N1K2-J Shiden (Violet Lightning) was codenamed "George" by the Allies. 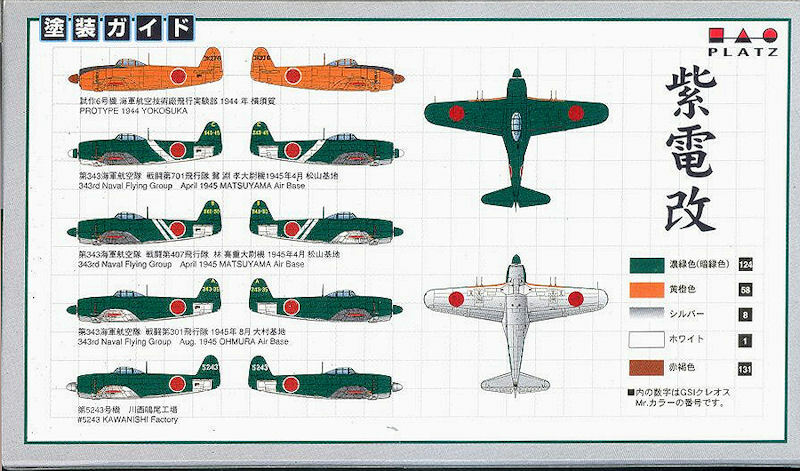 Development was interesting in that the Shiden was developed from the N1K Kyofu (Strong Wind / Rex), a floatplane. 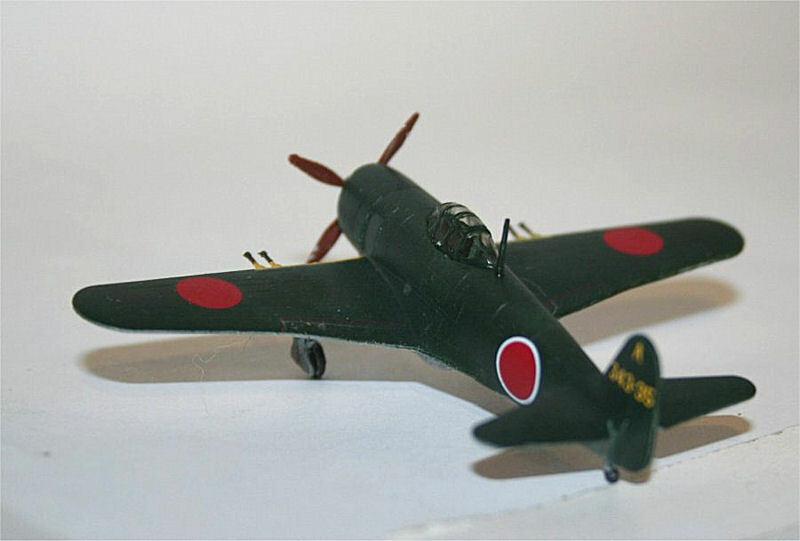 The Shiden was heavily armed, with 4 x 20 mm cannon in the wings. It was considered the equal of the Hellcat, and could hold its own with the Corsairs and P-51s. As a bomber interceptor, it was hampered by poor rate of climb and inadequate engine performance at high altitudes. The prototype flew in 1943, and the type entered production in January of 1944. Production never exceeded 83 per month (April and May 1945), and only 423 were produced before VJ day. There are 4 surviving Shidens, one at the Naval Air Museum at Pensacola, one at the USAF Museum near Dayton, one at the Champlin Air Museum (on loan from the National Air and Space Museum), and one at Shikoku, Japan. You get 2 complete kits in the box, along with markings for 5 Georges. I was happy to have the fuselage halves fit so well. This kit is the same mold as Kit PD 11, but has the "later" tail and markings, with no cutting required. The interior consists of an instrument panel, a seat, and a control stick. The engine is a really nice piece of engineering, which almost nobody will see behind the prop and spinner. The wings consist of 3 parts, bottom and left/right tops. I had a little trouble getting the leading and trailing edges to mate cleanly. Tenax and clothespins helped a lot here. I added the horizontal stabilizers and the cowling, and it was ready to paint. With the diminutive size of this kit, it's nice to have a simple paint job. I used Tamiya JN-1 Green for the top and Testors Silver for the bottom. A coat of Future prepped the model for markings. 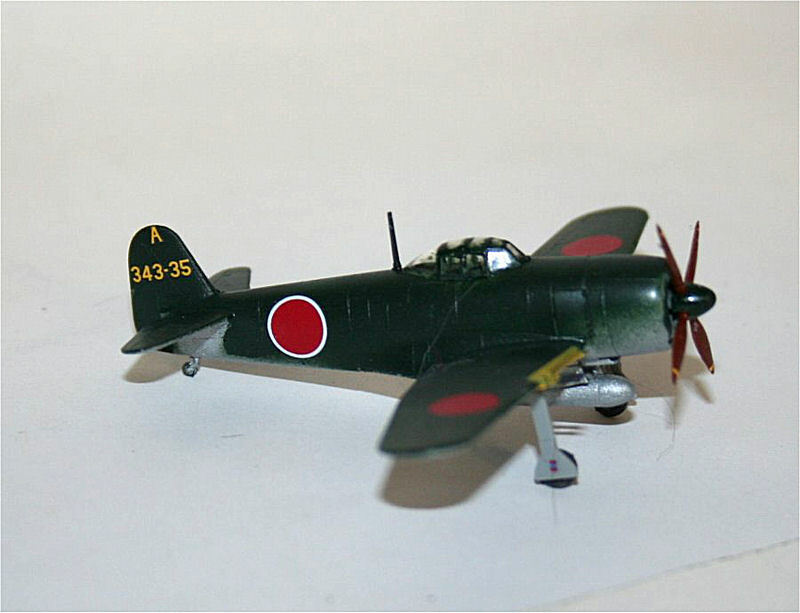 I did this one as an aircraft from the 343rd Flying Group at Ohmura, August 1945. The decals are marvelous. They're by Cartograf of Italy, and they're extremely high quality. The only problems I had were that the tiny decals for the prop warning and the landing gear doors were so small that they floated on the surface tension of the tiny bit of water I put on to allow me to move the decal. I had to rewet a couple of these, as they'd float off from where I wanted them. Patience and a sewing needle finally got everything in place. After the decals had set up, I applied another light coat of Future, followed by some Testors Acrylic Flat. Then I put on the prop and spinner, landing gear and tail wheel, canopy and the antenna. Finished. Highly recommended for those interested in World War II in Braille scale. Fit is excellent, and the kit is nicely engineered. The decals are super. The only problem I had was keeping track of those ultra-tiny parts. Thanks to Platz for providing the kit, and to IPMS/USA and John Noack for letting me build it.